A lot of things were accomplished this trip – the top two missions were to be with dad and mom and also try to meet some old teachers. Could not meet many – actually any – of my old classmates, friends from neighborhood and all that. Although, did get “bhaiphnota” after three and a half decades from my sister. Finally, it was time to do something just for myself. After alighting at Frankfurt airport, went to the biggest Duty Free shop and got hold of one of those helpful young gentleman from the store. They had a huge wine and liquor section. I am nothing if not a bunch of quixotic passions put together. 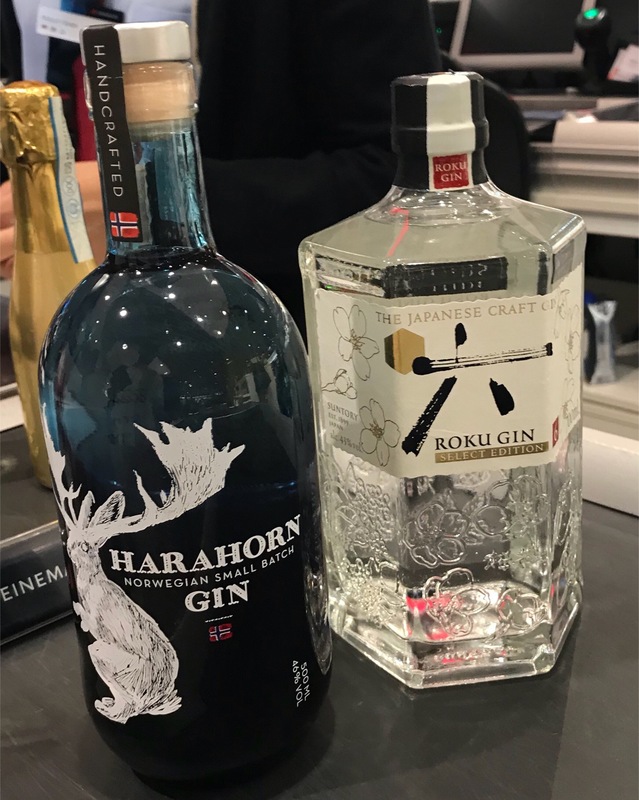 Since gin is my major area of focus this year on the cocktails front (and looking at my inventory, it is promising to go well into next year), I asked him if he could show me some German gin. He got me a bottle of Monkey 47. But I have already gone thru that. He had none other. Changed my tack – showed him the list of 11 countries that I have gins from. “If you can get me gins from any country other than these 11, I will buy them”. We settled for Norway and Japan!! Undoubtedly, this trip was all about my dad. Watching him go thru the transitions and helping him phase into a new stage of life is what I was there for. What I had not counted on is the level of transition this meant for my mom. In an earlier post, I had written about the challenges of being a caregiver of a elderly patient with limited ability to move or make himself understood. I had further mentioned that on top of that, being a mother is totally incomprehensible to me in terms about effort and sacrifice. As the days went by, I realized another thing. My mom is realizing that, in addition to all those, she is now going to be the head of the household. She brought out a couple of big files from the almirah and asked my brother and I if we could explain to her the house finances. (Dad has no ability to explain anything). 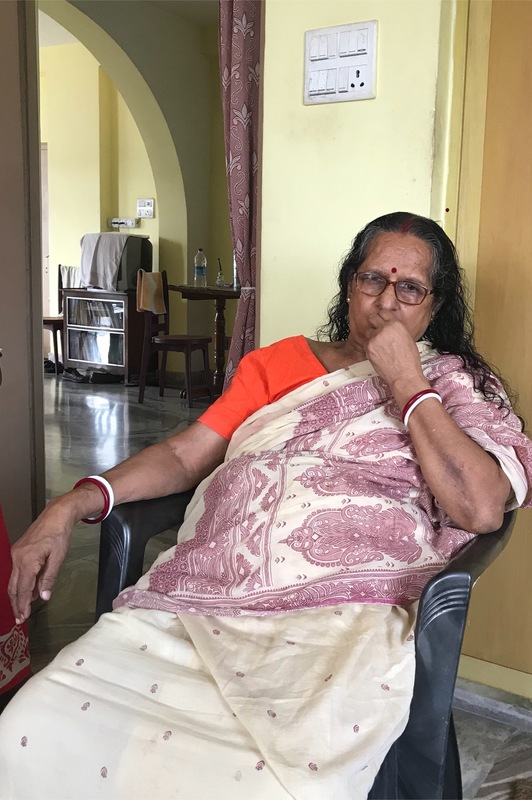 We sifted thru a lot of papers and bank passbooks and armed with some prior knowledge we had, we helped her understand her monthly expenses, sources of income and current assets in bank. In fact, my brother and I went to a couple of banks a few times (I went to an Indian bank after about 25 years!!) to set up a few things for her. In my previous visits, mom would either be cooking or sitting with us or be sleeping (remember, she is a psychiatric patients and those medicines have a strong sedative effect). This time, for the first time, I saw her often sitting by herself and in very pensive mood. She seemed to get very deep in her thoughts. I always wondered whether to interrupt her thoughts. One time, I managed to take a picture of her and then I did break down and asked her what was going thru her mind. “Eka songshar ki korey chaalabo tai bhaabchi”. She was thinking thru how she was going to manage all the family affairs by herself. That is when I realized that on top of her normal role and the added role of being the primary caregiver, she now has to be the head of the household too. Forget her. I myself became too confused how was one person going to deal with all of these. I have mentioned this before – For all the things my dad and mom are going thru, we have one of the best support systems you could think of. My sister lives next door to my parents. 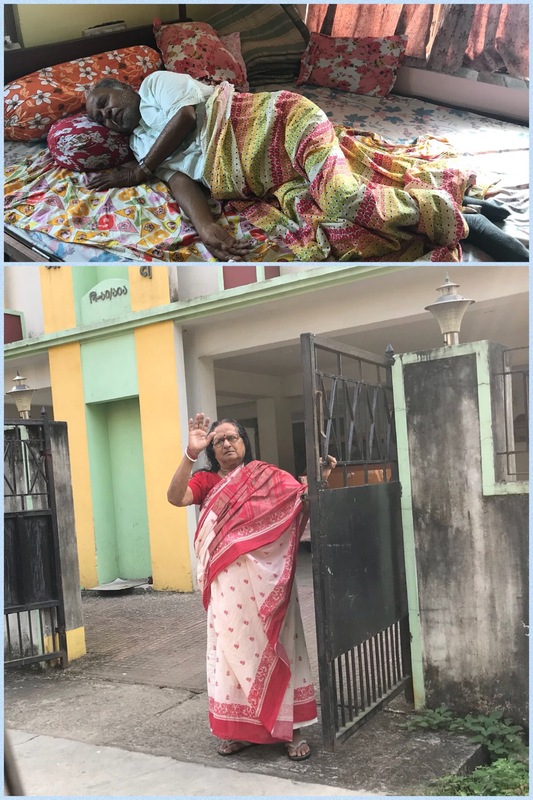 My brother lives couple of hours away and regularly visits them to get my dad’s medicines (those are available only in Kolkata). And I get to see them every three months. Between the three siblings, till date, we have been fortunate enough to financially support them on any care or services they might need. I know none of these are constants and things can change on any front dramatically quickly but that said, till date, we have been incredibly lucky in our support system for parents. 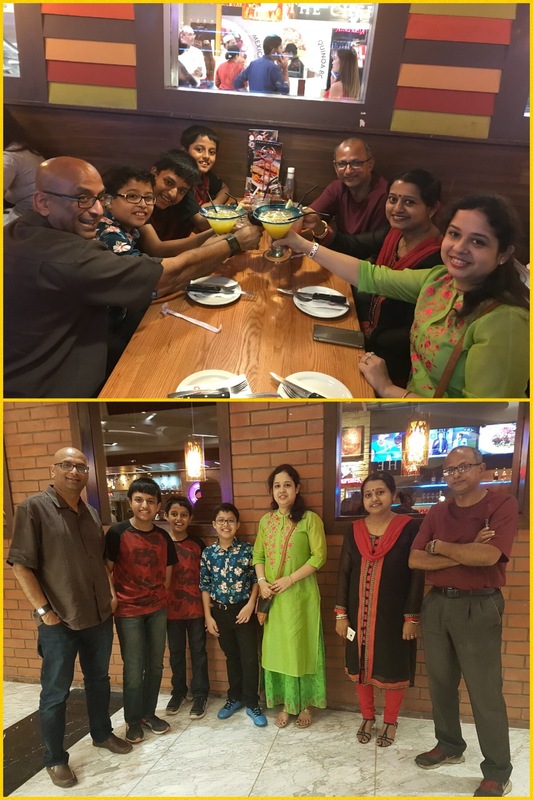 Even then, watching my mom, the thought came across my mind – may be I should just go and stay with them for the last few years of their lives. Sometimes journeys are memorable due to the newness of things – new places seen, new people met, new experiences undergone. And sometimes journeys are memorable due to the constancy of a few things. It is like those are the things you actually look forward to for every such trip. Not to forget hitting the road with my brother. Every trip entails meeting some new people after a few decades. And that means driving to new cities and towns and testing the limits of Google maps in the Indian context (it does amazingly well, by the way). My brother insists on driving always and we spend quite some time together on the roads. We have some incredible experiences on the road. 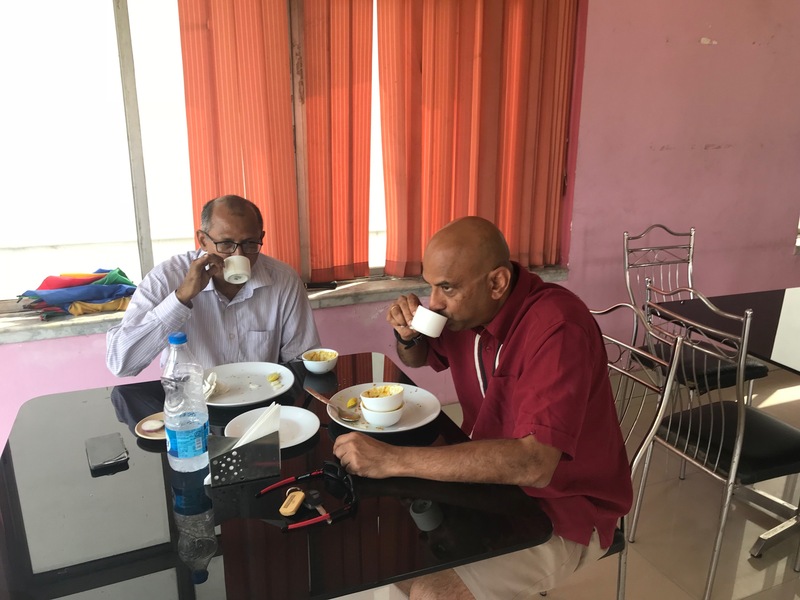 Which brings me to one more of those “constant things” – having tea with him at various tea stalls along all the highways and village roads. We usually choose those tea stalls that do not have a lot of customers – which allows us to make friends with the tea stall owner and find out more about the neighborhood. This particular one was taken somewhere on Durgapur Expressway near Saktigarh (for the ones familiar with the area – this is NOT one of those thousands of places selling “langchas”). 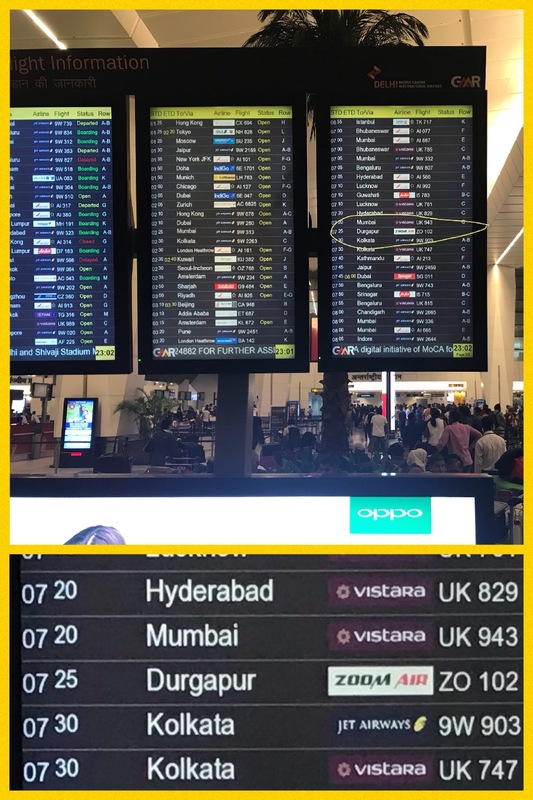 Upon entering Delhi airport last night, I was glancing thru the list of flights on the boards to see where I was supposed to go and finish my check in for the Lufthansa flights. Somehow, among all those flights listed in three big boards, my eyes got arrested on one line. “Durgapur”!!! My small old town has flights going from Delhi!! I was aware of a new airport and I think there are very limited number of flights going there (one? two?) but I had never seen Durgapur’s name up their on those flight boards. That was a random moment from this trip – but one of somehow great satisfaction. Not sure why? Maybe a throw back to those good old days when we – the three siblings- were all below 10 and used to play imaginary airplane games in our backyard? Like I said – felt good though!! Walked up to the empty Lufthansa counter to check in for my flight back and did my usual small talk with the young lady at the counter – you know “How long have you been with Lufthansa?”, “Are you from Delhi” and all that. And in the middle of that I yelled “Whoa!”. She looked at me inquisitively. I was still staring at the memo listing the stuff I cannot have in my checked in luggage!! After glancing thru the usual list of dangerous things, I came to a screeching halt when I saw the picture of a coconut! 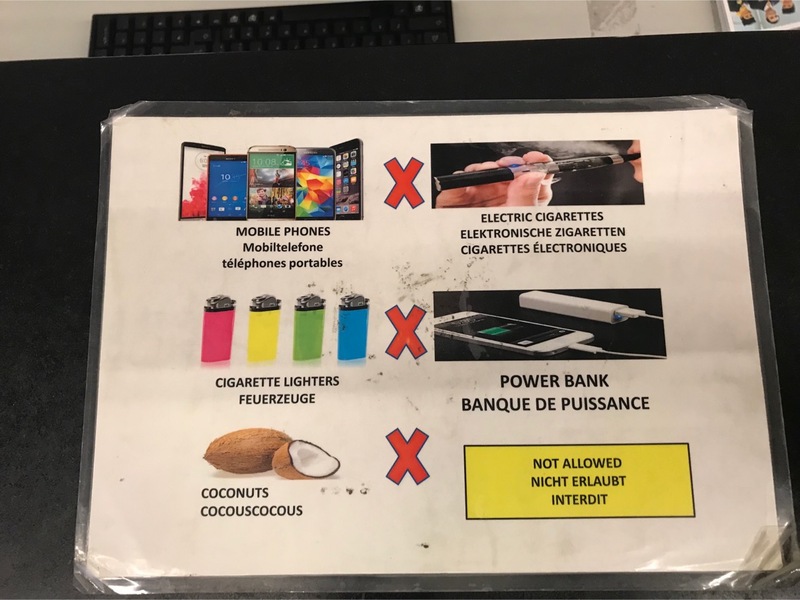 Why is the coconut in the list? 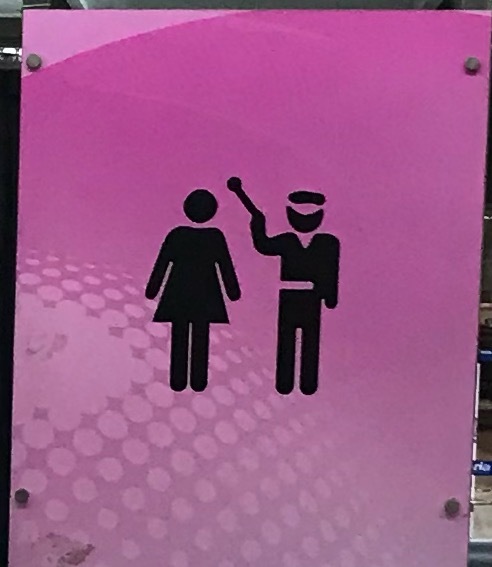 What did the poor coconut do? When is the last time a terrorist threatened national security with a errrrr…. coconut? On an aside, WHO is carrying coconuts in their carry on luggage? These goodbyes are not getting any easier…. Every three months for the last five years, we have gone thru the same routine. He would have sadness writ all over his face but mom would still brave a smile as they waved me good bye from the gate downstairs and I headed out to the airport to my family in Atlanta. As routine as it was, it never ceased to give me a lump in my throat. My brother (always the chauffeur) would keep quiet for 10 minutes and give me the space to get used to the moment. Then my dad lost ability to move much. But he would come downstairs and sit in a chair way ahead of time and wait for me so as to not lose a chance to wave me goodbye. I would again choke up. Next, he stopped coming down. (The last trip was that way to) He would simply lie in his bed and nod his head. Holding back tears was incredibly tough. I knew he wanted to come down but physically he could not. I used to squeeze his hand just to let him know that I understood. Now, we are in the phase, where he has no idea that I already left. He got up for ten minutes in the morning, spoke to me incoherently and then went back to sleep. I took a lot of pictures of him. All of them look exactly the same. At the back of my mind, I am aware that this might well be the last time and I wanted to capture ever micro second if I could. Even if they are repeats. First time ever, my mom is not smiling as she bade adieu all by herself. Category: Vacations | 57 Comments on These goodbyes are not getting any easier…. Category: Vacations | 43 Comments on Have you seen this before? Is there such a word? What do you think? Back in 1977, Kelvin Donegan was our English teacher. With his blonde hair, fair skin, smart dress, sharp goatee and a motorcycle to boot – we, the fifth graders, were in awe of him. When he said something, we listened. And remembered. One day that year, one of my classmates (I forget who it was) had used the phrase “bus stoppage” in one of those “make sentence” exercises. “Bus stoppage” was (and I suspect still is) very commonly used in Bengal. Not sure of outside Bengal. In any case, Sir Donegan had firmly told us that there was no such thing as “Bus Stoppage”. That is a made up word by Bengalis. Ever since, I got used to saying and writing “Bus Stop”. 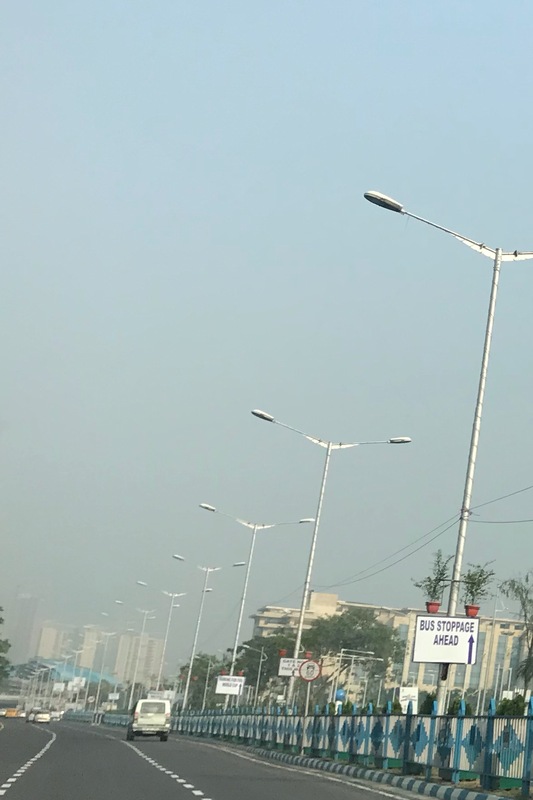 While being driven to the airport a couple of days back, I noticed this sign along EM Bypass (these have been put up for the FIFA Under 17 World Cup being held in Kolkata). I realized that “Bus Stoppage” is still alive and kicking in Bengal. Just to be sure, quickly checked Google. Apparently, “stoppage” is a perfectly good word. But looks like “Bus Stoppage” may not be. Category: Vacations | 15 Comments on Is there such a word? What do you think? 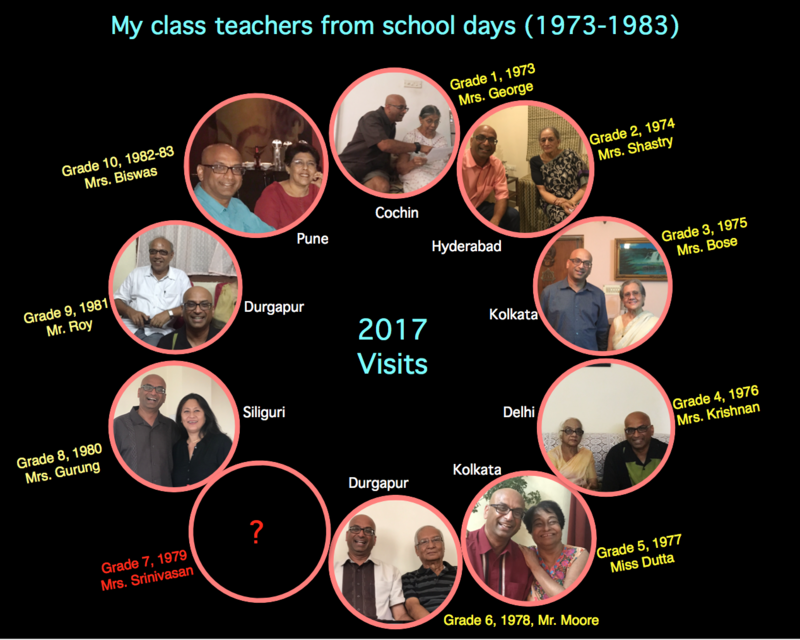 This year, I have been able to locate and visit 9 out of 10 of my home room teachers. They are strewn all over India. Each search was very satisfying (of course after the frustration of numerous false leads). In the end, being able to say “Thank you” to each and every one of them face to face has been an unforgettable experience! As I have maintained before, they were crucial influences in my formative years. I have no doubt that without their combined influence, I would not be who I am. Meanwhile, time to move on to the subject teachers then! !